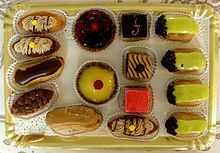 A petit four (plural: petits fours, also known as mignardises) is a small bite-sized confectionery or savoury appetizer. The name is French, petit four (French pronunciation: ​[pə.ti.fur]), meaning "small oven". In 18th and 19th century France, gas ovens did not exist. Huge brick ovens were used, which took a long time to heat up but also to cool down. Bakers used the ovens during the cooling process, taking advantage of their stored heat, for baking pastry. This was called baking à petit four (literally "at small oven"), a lower temperature which allowed pastry baking. In a French patisserie, assorted small desserts are usually called mignardises, while hard, buttery biscuits are called petit fours. 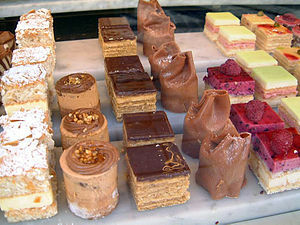 Wikimedia Commons has media related to Petits fours. Garrett, Toba. Professional Cake Decorating. Hoboken, N.J.: John Wiley & Sons, 2007. Page 226. Kingslee, John. A Professional Text to Bakery and Confectionary. New Delhi, India: New Age International, 2006. Page 244. Maxfield, Jaynie. Cake Decorating for the First Time. New York: Sterling Pub, 2003. Page 58. Rinsky, Glenn, and Laura Halpin Rinsky. The Pastry Chef's Companion: A Comprehensive Resource Guide for the Baking and Pastry Professional. Hoboken, N.J.: John Wiley & Sons, 2009. Page 214. ^ Lynne Olver. "The Food Timeline: history notes--cookies, crackers & biscuits". ^ Jebirashvili, Revaz. "The History of Petit Fours". Mini Desserts. Retrieved 10 February 2015.